The Archbishop of Canterbury has invited the Anglican Communion's 37 leading bishops to attend a special Primates' gathering in January to shore up divisions often provoked by differences over human sexuality by drastically reorganizing the group. Archbishop Justin Welby said: "I have suggested to all Primates that we need to consider recent developments but also look afresh atour ways of working as a Communion and especially as Primates, paying proper attention to developments in the past." Welby is proposing to effectively dissolve the fractious and bitterly divided worldwide Anglican Communion and replace it with a much looser grouping, The Guardian newspaper speculated Sept. 17. "He believes that the communion – notionally the third largest Christian body in the world with 80 million members, after the Roman Catholic and the Orthodox churches - has become impossible to hold together due to arguments over power and sexuality and has, for the past 20 years, been completely dysfunctional," wrote the Guardian. The meeting in January will allow Primates to discuss key issues face to face. It will included a review of the structures of the Anglican Communion and a decision together on their approach to the next Lambeth Conference, a gathering of bishops from the world. The Anglican bishops around the world should meet up every 10 years in Canterbury at the Lambeth Conference. But nearly 250 out of 800 stayed away from the last meeting, in 2008, in protest against the supposed liberalism of Williams, said the Guadian. Welby had previously announced the indefinite postponement of the next conference. The Anglican Communion said the January meeting "is likely to include the issues of religiously-motivated violence, the protection of children and vulnerable adults, the environment and human sexuality." Welby had worked in management positions in the oil and banking industries before turning to once to the Church. He said: "I have suggested to all Primates that we need to consider recent developments but also look afresh at our ways of working as a Communion and especially as Primates, paying proper attention to developments in the past." The Anglican leader is "preparing to gamble his legacy on a high-stakes plan to overhaul the 80 million-strong worldwide Anglican church in what he sees as a 'last throw of the dice' to avert a permanent split over issues such as homosexuality," The Daily Telegraph reported. One idea under consdieration is to effectively dissolve the Anglican Communion as it currently exists, with 38 national churches, or provinces, are formally linked to each other. It could be a a slimmed-down structure in which they are all tied to the "mother church" in Canterbury even if, in some cases, they have no communication with each other, said the Telegraph. Lambeth Palace sources said the idea is that each church would have enough "wriggle room" to hold different positions on questions like gay marriage without breaking up the wider Anglican "family". "It's not quite a legal separation, if one is going to pursue that metaphor I think it's more moving into separate bedrooms," one source explained to the newspaper. "Our way forward must respect the decisions of Lambeth 1998, and of the various Anglican Consultative Council and Primates' meetings since then," Welby said on the Anglican Communion website. "It must also be a way forward, guided by the absolute imperative for the church to proclaim the gospel of Jesus Christ, to make disciples and to worship and live in holiness, and recognising that the way in which proclamation happens and the pressures on us vary greatly between Provinces. We each live in a different context." "The difference between our societies and cultures, as well as the speed of cultural change in much of the global north, tempts us to divide as Christians: when the command of scripture, the prayer of Jesus, the tradition of the church and our theological understanding urges unity. 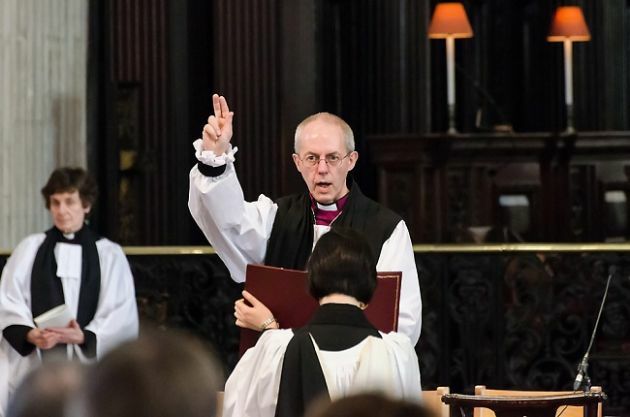 "A 21st-century Anglican family must have space for deep disagreement, and even mutual criticism, so long as we are faithful to the revelation of Jesus Christ, together," said Welby.